Gourmet mushrooms are an excellent way to add an enhanced layer of flavor to a variety of dishes including soups, sauces, stews and any recipe with meat, poultry or fish. Mushrooms can be a relatively low cost flavor enhancing ingredient if you know how to select, clean and store them to get the most value. Mushrooms are found all over the world and have a tradition of being a very honored food in many cultures. Ancient Egyptians saw mushrooms as food for only the royals to enjoy. They were coveted by French royalty, harvested in caves in the 17th century for the exclusive use of the wealthy. Mushrooms did not reach the United States until the late 1800s and were still considered a delicacy for the rich. Naturally - Mushrooms can be harvested from nature during a limited few months each year. Some grow in exposed areas such as within a grassy area. Others grow on woody logs or, as in the case of truffles, some grow underground. Be careful with naturally harvested mushrooms: Not all natural mushrooms are edible, so you need to be careful when harvesting mushrooms. Several varieties are poisonous and can cause illness or death. Cultivated - These mushrooms are grown in controlled environments throughout the United States. Typically the mushrooms are grown in a mixture of sawdust and rice hull in dark, damp conditions. Some of these mushroom farmers use organic products and methods and are certified by the United States Department of Agriculture. There are many types of gourmet mushrooms, each with very different visual and taste characteristics. Mushroom colors range from white to very dark brown. Most have a cap and a stem with larger tops than bottoms. Some have very delicate tastes, some have rich flavors. Mushroom textures range from the very delicate to the very chewy. The most common type of mushrooms. More intense flavor and density than the button mushroom. Large crimini-type mushroom. Excellent grilled. Earthy flavor. Commonly used in Japanese food. Expensive; but, meaty texture provides good value. Subtle taste with chewy texture. Grown in clusters. Rich flavor with golden color. Expensive; but, intense flavor. Typically sold dried. Thin long stems with small caps. Very expensive with an intense flavor and aroma. Gourmet mushrooms are available year round. When selecting mushrooms, look for caps and stems which are free from moisture and mold. 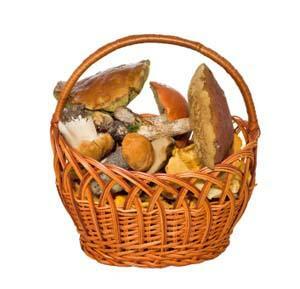 Avoid mushrooms that have dry or hardened areas either on the stems or under the cap. This can be a sign of a mushroom that is not fresh. Powdered, which is also called mushroom "flour"
For some types of mushrooms, drying will intensify the flavor and aroma. For example. the somewhat rare Black Trumpet mushroom (sometimes called the "Horn of Plenty") has a much more intensive taste and aroma when it is dried. Some dried mushrooms have a very intensive flavor and are only used as a seasoning. Dried mushrooms need to be soaked in hot water for about 20 to 30 minutes and rinsed before they are used. The soaking water can be used in sauces and soups to intensify or add a mushroom flavor. Limited quantities of all mushrooms are dried. Expensive mushrooms such as truffles and porcini mushrooms are frequently dried to provide maximum taste and aroma for significantly less money than would be spent on using these same varieties in a fresh form. Some dried mushrooms are also ground into a powder which can provide a special mushroom flavor to baked bread, freshly-made pasta and as a seasoning for sauces. Refrain from cleaning any mushrooms until they are ready to be used. At that point remove any bits of debris from the outside or underside. Just gently wipe the surface with a damp cloth or paper towel. Or, use a soft brush. Some varieties of gourmet mushrooms such as shitake and portobella tend to have a tough stem. This stem should be pulled off and thrown out or only used as a flavoring agent and then removed before serving. Mushrooms should be stored in a paper bag in the refrigerator. Paper provides a dry environment. Avoid storing mushrooms in plastic bags which can create and hold moisture which will cause the mushroom to spoil quickly. Mushrooms can be stored for about five days if stored properly. If you want to save the mushrooms for a longer period, you can freeze them for up to several months. Before storing them in the freezer they need to be cleaned, cooked and stored tightly in a small container which will minimize the air flow around the mushrooms.